So, for a "design process" blog, I haven't posted much design process in a while, huh? Sorry about that! 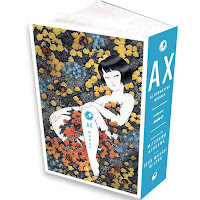 How about this: over at the Top Shelf blog, Brett Warnock recently posted a link (along with some very flattering comments that I probably don't deserve) to the page of comps I sent them for their upcoming AX anthology of "alternative manga"--basically, manga for people who like to think. If you've read any of those great Yoshihiro Tatsumi anthologies Drawn & Quarterly has been putting out for the past few years, you'll have an idea of what to expect. (Useless trivia: Good Bye was the Yankee Swap gift I (happily) went home with from last year's Criterion Holiday party.) You can also see some sample pages (and relevant links) at editor Sean Michael Wilson's blog. Anyway, the anthology collects material from a Japanese anthology magazine of the same name, so the editors had already decided on the cover art they wanted for the first volume (of what will hopefully be a continuing series), and we knew we had a wealth of great cover art to choose from going forward. (You can browse some of that cover art at this (official, I think?) Japanese AX site. )My job, then, was to create a series design template that could be used for this and future volumes. Okay, here's four options for the AX series. Because this is something that will want to continue on through future volumes, I've mocked up each idea using both the first volume cover and also with the other illustration you gave me that might wind up on a future volume, to give you an idea of how it might evolve. This is pretty straightforward, but effective, I think... a good, simple option. Colors can change from series to series but placement, etc, should remain consistant. The top left corner placement mirrors the original japanese covers, so we can be confident that that space will be available on any future illustrations you might want to use. This one is the most intrusive on the art, and for that reason I'm least fond of it, but I wanted to send one option that felt more "magazine-y." And on the other end of the spectrum, this one is the least intrusive on the art, and therefore my favorite. 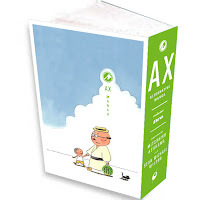 The cover would contain only the "ax" logo (taken from the original japanese editions) and the minimal type, which can be placed wherever is most attractive on the art. Then the spine becomes much more important for conveying the information that would otherwise have been on the cover, but that's okay because this is going to be such a thick book (400 pages, right? ), so we'll have lots of spine real estate to play with. I've mocked up some 3D versions to show how this could work, with the spine picking up on the color from the logo on the cover. The white border around the image on the cover will also help to be a consistent element to maintain harmony through the series. This last one is definitely my favorite... when you've got such a great image as that girl in flowers image, the more you can let that speak for itself, the better, in my opinion. Beautiful work (I love that spine). From a pure visual standpoint, my personal favorite is the fourth one too (I really like the way you used the shape of the cloud to frame the logo in Vol. 2), but as a small (tiny would be more accurate) publisher myself, I understand perfectly Top Shelf's choice: it's beautiful, eye-catching and it conveys the exact amount of information for the reader. Also, as a rabid fan of Tatsumi and Taniguchi, I'm really looking forward to any anthology that leads me to the discovery of new authors, and this one looks like a sure buy. Cheers! 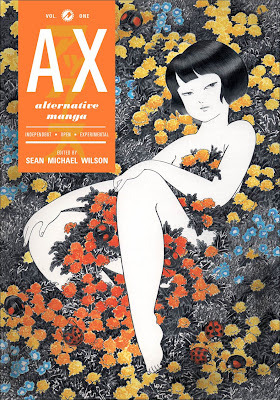 Its Sean, the editor of AX: alternative manga. Thanks for putting these up for folk to see. Looking lovely, of course! Oscar: there is a great 22 page Tatsumi story in the collection,translated for the first time. And a HOST of other wonderful stuff for fans of gekiga/mature manga to see. Its really an honour for me to help bring this stuff out as a Top shelf book.